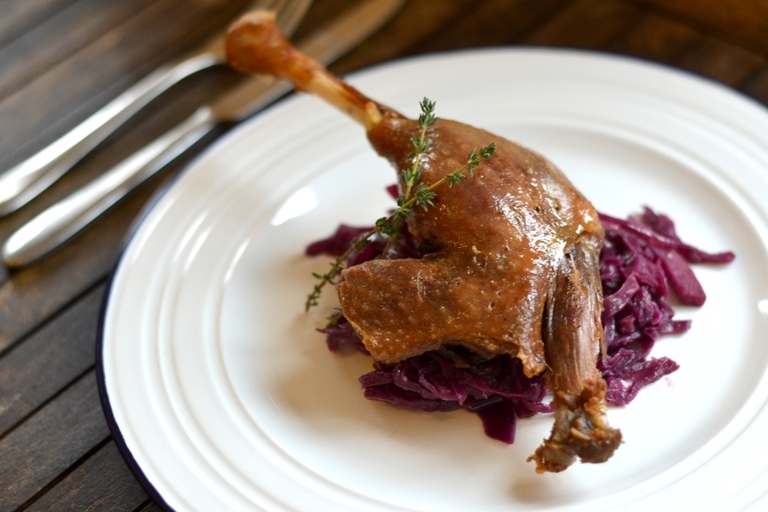 Cook up this superb confit goose leg recipe to give away to a loved one as an edible gift this Christmas. Or you could always keep them for yourself – we won't judge. Of course, this method could be applied to all manner of birds legs – confit duck legs are sublimely tasty if you're on a tighter budget. Once cooked up, this is great with some braised red cabbage or just devoured on toast. Like a lot of self-appointed and self-important gourmands, when the annual festivities come speeding around the corner, my list for Father Christmas usually contains a whole host of things food-related. Cookbooks, kitchen gadgets and equipment are often the order of the day. Which is great. There is nothing better than getting all choked up after unwrapping a temperature probe and burger making kit. ‘Thank you Nan,’ I’ll whisper into her ear, whilst administering a hug. ‘Thank you for getting me this and not the usual socks and pants.’ That never quite fit. I have come unstuck before though, after putting in some more prosaic requests that seemed sensible at the time. Too sensible really. I remember clearly, sitting in the living room one year and when all the frenzy died down, feeling quite empty after seeing fellow family members dance about, each of them with snazzy clothes, DVD’s, perfume and whatnot. We do secret Santa in our family you see, with a strict budget. The person buying my present chose to blow the whole lot on a huge, expensive stock pot; ignoring a lot of smaller bric-a-brac that I was after. So I was sat there afterwards, with it perched on lap, thinking ‘Bloody hell Mum, you could have got a cheap one in IKEA.’ Like a most ungrateful and spoilt brat, aged 33. Nowadays, having more than enough kitchen junk and books than I can cope with, I think I would be happier to receive edible goods and the odd alcoholic treat this year. I am not thinking about the usual collection of beer flavoured pickles or plastic grinders filled with vivid red peppercorns here, as seen on supermarket shelves, next to shower gel sets and luminous singing rubber ducks. (Who really wants that sort of present anyway?) No, I’d like something that was delicious to eat, properly nourishing and possibly homemade; with love, care and attention. 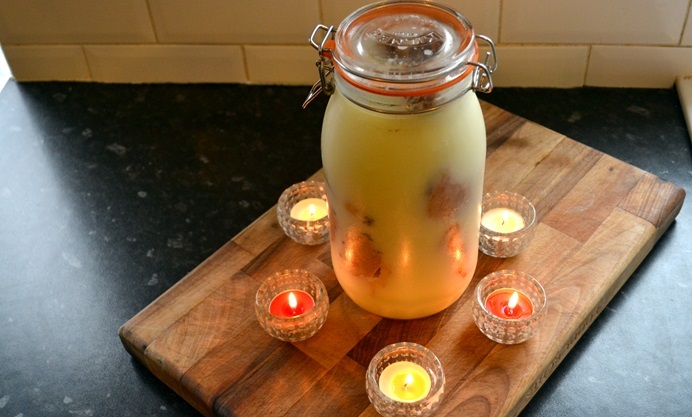 Something like a big jar of goose confit. 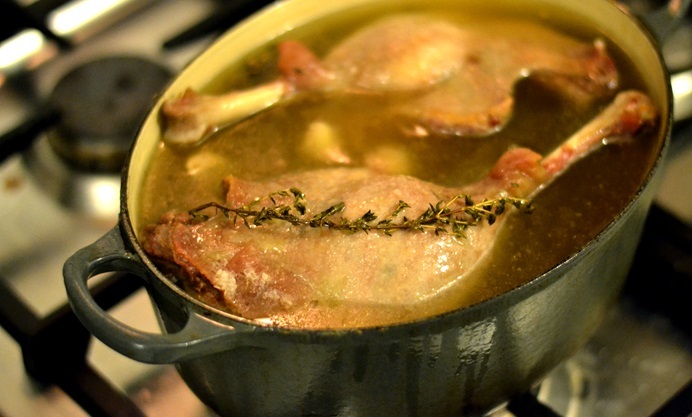 Confit, if you are not aware, is a simple process that involves cooking lightly-cured meat in melted fat, at a low temperature, for a long time. The meat and fat is then left to cool together so that everything solidifies, providing a protective barrier against bacteria, which results in a technique of preservation that has been around for centuries. Duck legs are usually associated with this peculiar practise of cooking and the curious thing for me, is that this method actually draws fat out whilst tenderising the meat. A piece of confit duck leg is actually healthier than say, plain roasted! Or at least that’s what I like to keep telling myself. Seeing as it is Christmas though, why not up the ante and use goose legs instead, another popular, albeit slightly more expensive bird that suits confit. 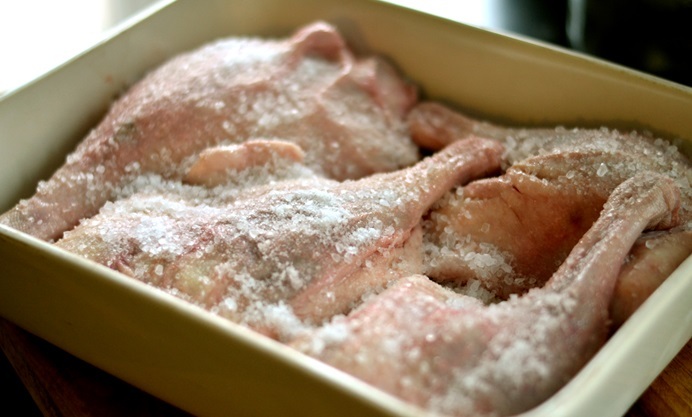 Buying up enough goose fat to cover the legs can have a knock on that budget but you can get just as good results by replacing half the amount needed with vegetable oil or plain lard. I also find that fitting the legs into a smaller snug space, like a medium-sized casserole, helps to cut down on the amount of fat needed. Adding few herbs here and there is another good idea, along with some cloves of garlic but make sure that you clean off the salt properly before cooking. The rich meat benefits from a decent period of curing but if you leave too much salt behind, the legs will have you reaching for pints and pints of water afterwards. The biggest key though is making sure that you have a jar large enough to stick them in afterwards, for visual impact, if anything else. I know if I were to unwrap something like this on Christmas Day, I wouldn’t be that bothered if there was nothing else for me under the tree. But you wouldn’t catch me sharing it. Oh no. You can just run off and play with your miniature Connect 4, VW Camper Van speakers or whatever else you got.